The Advanced Telescope for High ENergy Astrophysics (ATHENA) is a future X-ray telescope of the European Space Agency, under development for launch around 2031. It is the second (L2) large class mission within ESA Cosmic Vision Program. ATHENA will be one hundred times more sensitive than the best of existing X-ray telescopes—the Chandra X-ray Observatory and XMM-Newton. XMM-Newton, also known as the High Throughput X-ray Spectroscopy Mission and the X-ray Multi-Mirror Mission, is an X-ray space observatory launched by the European Space Agency in December 1999 on an Ariane 5 rocket. It is the second cornerstone mission of ESA's Horizon 2000 programme. Named after physicist and astronomer Sir Isaac Newton, the spacecraft is tasked with investigating interstellar X-ray sources, performing narrow- and broad-range spectroscopy, and performing the first simultaneous imaging of objects in both X-ray and optical wavelengths. BeppoSAX was an Italian–Dutch satellite for X-ray astronomy which played a crucial role in resolving the origin of gamma-ray bursts (GRBs), the most energetic events known in the universe. It was the first X-ray mission capable of simultaneously observing targets over more than 3 decades of energy, from 0.1 to 300 kiloelectronvolts (keV) with relatively large area, good energy resolution and imaging capabilities. BeppoSAX was a major programme of the Italian Space Agency (ASI) with the participation of the Netherlands Agency for Aerospace Programmes (NIVR). The prime contractor for the space segment was Alenia while Nuova Telespazio led the development of the ground segment. Most of the scientific instruments were developed by the Italian National Research Council (CNR) while the Wide Field Cameras were developed by the Netherlands Institute for Space Research (SRON) and the LECS was developed by the astrophysics division of the European Space Agency's ESTEC facility. The Compton Gamma Ray Observatory (CGRO) was a space observatory detecting photons with energies from 20 keV to 30 GeV, in Earth orbit from 1991 to 2000. It featured four main telescopes in one spacecraft, covering X-rays and gamma rays, including various specialized sub-instruments and detectors. Following 14 years of effort, the observatory was launched from Space Shuttle Atlantis during STS-37 on April 5, 1991, and operated until its deorbit on June 4, 2000. It was deployed in low earth orbit at 450 km (280 mi) to avoid the Van Allen radiation belt. It was the heaviest astrophysical payload ever flown at that time at 17,000 kilograms (37,000 lb). Hitomi, also known as ASTRO-H and New X-ray Telescope (NeXT), was an X-ray astronomy satellite commissioned by the Japan Aerospace Exploration Agency (JAXA) for studying extremely energetic processes in the Universe. The space observatory was designed to extend the research conducted by the Advanced Satellite for Cosmology and Astrophysics (ASCA) by investigating the hard X-ray band above 10 keV. The satellite was originally called New X-ray Telescope; at the time of launch it was called ASTRO-H. After it was placed in orbit and its solar panels deployed, it was renamed Hitomi. The new name refers to the pupil of an eye, and to a legend of a painting of four dragons, two of which were given eyes and flew into the sky, and two that were left eyeless and stayed as motionless art. The spacecraft was launched on 17 February 2016 and contact was lost on 26 March 2016, due to multiple incidents with the attitude control system leading to an uncontrolled spin rate and breakup of structurally weak elements. Johannes Alphonsus Marie "Johan" Bleeker is a Dutch space technology scientist. He was director of the Netherlands Institute for Space Research from 1983 to 2003. He was involved in the setting up of the Horizon 2000 and Horizon 2000+ projects of the European Space Agency. Wikimedia Commons has media related to Astronomische Nederlandse Satelliet . The Herschel Space Observatory was a space observatory built and operated by the European Space Agency (ESA). It was active from 2009 to 2013, and was the largest infrared telescope ever launched, carrying a 3.5-metre (11.5 ft) mirror and instruments sensitive to the far infrared and submillimetre wavebands (55–672 µm). Herschel was the fourth and final cornerstone mission in the Horizon 2000 programme, following SOHO/Cluster II, XMM-Newton and Rosetta. 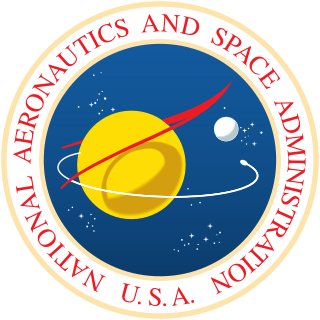 NASA is a partner in the Herschel mission, with US participants contributing to the mission; providing mission-enabling instrument technology and sponsoring the NASA Herschel Science Center (NHSC) at the Infrared Processing and Analysis Center and the Herschel Data Search at the Infrared Science Archive. INTErnational Gamma-Ray Astrophysics Laboratory (INTEGRAL) is a currently operational space telescope for observing gamma rays. It was launched by the European Space Agency into Earth orbit in 2002, and is designed to detect some of the most energetic radiation that comes from space. It was the most sensitive gamma ray observatory in space before NASA's Fermi was launched in 2008. The gamma-ray burst coordinates network (GCN) is a system that distributes information about the location of a gamma-ray burst (GRB), called notices, when a burst is detected by various spacecraft. The GCN also automatically receives and distributes messages, called circulars, about follow-up observations to interested individuals and institutions. Follow-up observations may be made by ground-based and space-based optical, radio, and X-ray observatories. 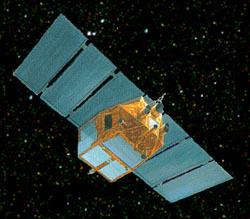 SCIAMACHY was one of ten instruments aboard of ESA's ENVIronmental SATellite, ENVISAT. It was a satellite spectrometer designed to measure sunlight, transmitted, reflected and scattered by the earth's atmosphere or surface in the ultraviolet, visible and near infrared wavelength region at moderate spectral resolution .. SCIAMACHY was built by Netherlands and Germany at TNO/TPD, SRON and Dutch Space. The Russian Space Research Institute is the leading organization of the Russian Academy of Sciences on space exploration to benefit fundamental science. It was formerly known as the Space Research Institute of the USSR Academy of Sciences. Cosmic Vision is a European Space Agency (ESA) long-term space science missions programme spanning between years 2015 and 2025, a successor to the Horizon 2000 long-term scientific programme. The Space Infrared Telescope for Cosmology and Astrophysics (SPICA), initially called HII-L2 after the launch vehicle and orbit, is a proposed infrared space telescope, follow-on to the successful Akari space observatory. It is a collaboration between European and Japanese scientists, which was selected in May 2018 by the European Space Agency (ESA) as a finalist for the next Medium class Mission 5 of the Cosmic Vision programme. Its sensitivity would be more than two orders of magnitude over both Spitzer and Herschel space telescopes. The SAFARI imaging spectrometer is the European ‘nerve center’ of Japanese infrared telescope SPICA and is being developed under the leadership of SRON Netherlands Institute for Space Research. SAFARI is an infrared camera with about 6,000 pixels that can make real ‘photos’ of the sky in three adjacent wavelength areas. Using a Fourier transform spectroscopy (FTS) detailed spectral information is obtained, allowing astronomers to determine the chemical composition of the observed celestial sources. TNO is developing the mechanism of this FTS. Sentinel-5 Precursor (Sentinel-5P) is an Earth observation satellite developed by ESA as part of the Copernicus Programme to close the gap in continuity of observations between Envisat and Sentinel-5. 1 2 "Algemeen directeur Karel Wakker verlaat SRON" (in Dutch). Netherlands Institute for Space Research. 30 January 2009. Retrieved 26 June 2016. ↑ "New directorate at space research institute SRON". Netherlands Institute for Space Research. 21 June 2010. Retrieved 26 June 2016.